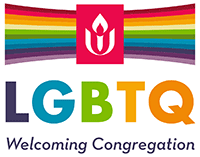 Visitors and guests are welcome each and every Sunday at First Unitarian. The Sunday service at 10am offers concurrent Religious Education for children and youth ages pre-K through 12th grade. There is also a nursery for families with young children. If you are a family coming for the first time, we recommend you come at least 15 minutes early so you can settle your children in Religious Education prior to the service. Our Sunday services include a traditional Unitarian Universalist liturgy including: a call to worship; lighting of the chalice; hymns and music; a stories for all ages; time for meditation, reflection and prayers; a sermon; and closing words. You may want to read or listen to a sermon by one of our ministers so you can get a sense of the theological themes addressed in worship. 10:00am Worship in the Sanctuary (nursery care available). Religious Education for children and youth. 11:00am Social Hour in the Social Hall with coffee and treats. 11:30am Sunday Morning programs, including First Forum which each week offers a talk or conversation on a wide variety of topics. We can help you navigate your way around the building and get you connected to staff and programs at our Welcome Table just as you enter the sanctuary through the mains doors. You will find friendly volunteers to help guide you, and answer questions. Please take a moment to fill out a visitor card located at the Welcome Center and in the pews.